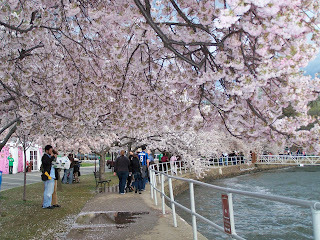 Here are a few photos I took on my quest to see the cherry blossoms. 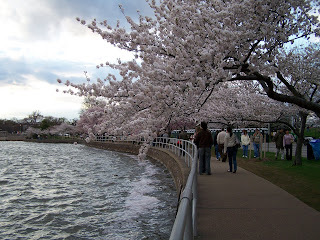 The best way to enjoy the cherry blossoms in D.C. is to walk around the Tidal Basin, which is fed by the water from the Potomac River. 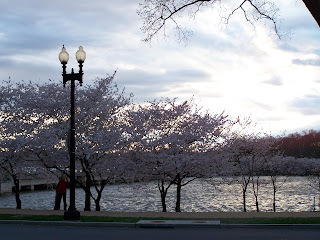 The walk around the Tidal Basin is about 2.1 miles, but it's a fun one because you'll be walking underneath a canopy of flowers. The sun was starting to set when I took this. It's best to visit in the evening as there are less visitors. A perfect place to have a picnic. According to the park guide, "the Japanese believe cherry blossoms are best experienced when a temple complements the scene. The Jefferson Memorial serves this function." The flowers this year were absolutely breathtaking and beautiful. I wish they'd last for the whole year, but such are the cherry blossoms - that bloom only once a year. i like the fourth one best. Cherry blossom trees are absolutely gorgeous. I have yet to see one for real. All I've seen of it are from storybooks, journals and movies! angeli and princess dyanie, thank you. yes, it is very relaxing just to walk around or find a bench to sit on and gaze at the water or listen to the flowers. toni, i hope you'll get to see a real one too. hope the photos help for now =). kayni, these are really pretty photos. 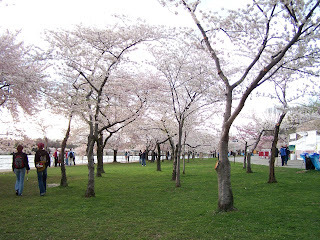 we were in maryland for the spring break last year and we planned on going to DC for the cherry blossoms but somehow, our plan changed and we were not able to go. hope to do it in the next couple of years. Sagada, Thank you. Still learning to take better photos =). I hope you'll make it to the cherry blossoms next year. It is a beautiful event. I miss hanami (flower viewing), drinking sake under the moonlight and under the sakura tree.. this i used to do as a student and as it was the tradition in Japan. 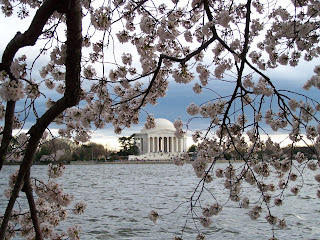 Artemis, if i bring sake to the cherry blossom park/tidal basin, i'll end up in jail...lol. alas, for me, seeing japan's cherry blossoms remains a dream.